which serves well as an overview of Johnny’s story as told in the book. The birth of a child, a first child especially, is the greatest, most anticipated, and at the same time the most frightening experience of a couple’s life. This was proven without a doubt when Johnny entered our lives after 53 hours of labour. The smiles on the doctors’faces belied the difficulty of the birth by Caesarean section and would haunt us for years. His mother was the first to notice that everything was not quite right. After several weeks of difficulties with breastfeeding she detected a minor flaw, which the experts passed off as a paranoid mother’s imagination working overtime. After all, he looked normal. There was no indication of the monster lurking within, but it was there, that little something, a weakness on the right side. “Cerebral palsy, right side hemiplegia, a classic case”. A sentence I had never heard before, but now it was our son’s life, our lives. He later manifested temporal lobe epilepsy and began to seizure regularly as if CP wasn’t enough. While we experienced them together as a couple, the recollections in this book are mine, his father. 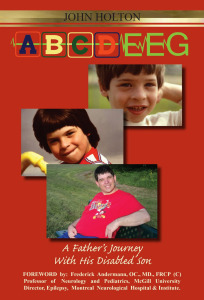 They document the growth of a disabled person from childhood to adulthood from a father’s perspective and are more than just a journal of experiences, they reveal the mental anguish and heartache of watching a loved one struggle with something they cannot control and which ultimately brought a family to the brink. Memory is a wonderful thing and is tempered with time. We tend to remember things sifted through a screen of growing maturity and wisdom. The recollections in this book are as accurate as possible, yet they are surely different than had they been written closer to the events. I could never have seen things then as I do now and frankly the prospect of attempting to do so would have been impossible. The emotions were too raw, too real to be expressed coherently then and would surely have ended in frustration and to be honest, anger. As it is now, the writing of this has become a catharsis and in effect this book is as much about me as my son. It didn’t start out that way, but as it progressed I found myself opening up honestly and quite often tearfully as I poured out my feelings. People have asked us how we managed to cope. They saw a snapshot of our lives and wondered. Yet, Johnny grew in small steps and we followed as best we could and tried to adapt as we went along. Many of our days were filled with horror and anguish, but more than a few were hilariously funny in an outrageous sort of way. These times formed the basis of what we called “Johnny stories” and they never failed to astound our listeners who marveled at the absurdity of our existence and yet laughed with tears in their eyes at the antics of our little tyrant. However, beneath the bravado, the toll was beginning to tell and we came to a point where we had scant hope for Johnny or ourselves. Our situation was critical and it seemed time to follow the advice of so many and put him away. We had fought this for years and weren’t about to give in easily. A last ditch effort to get help took us to the Montreal Neurological Institute where a team of doctors performed the surgery that became the miracle of our lives. This book tells the story of a remarkable young man and the family that stuck with him no matter what. It provides a voice for those in similar circumstances and offers insight to those who can only imagine. I trust that in some small way it provides comfort to those who are wrestling with their own problems and feel that no one understands. The lesson: in the end, sometimes hope wins out and most of all, love can hurt, but it never fails.